There are so many apps within the App Store and there are so many more on Google Play. It’s hard to tell what the up and coming design trends are but it’s significantly easier to pick five current trends and analyze them. Let’s see how color, innovative ideas and simplicity of current apps can teach us a thing or two about mobile app design. Color has always been part of design by default. However, recently may apps use color as the basis of the design rather than just accents. Color greatly affects the overall experience of an app by setting the mood. This can be clearly experienced when you compare a colorful app to one that is mostly white. Often times, color is used to create a personality of an app such a friendly, fun or elegant. 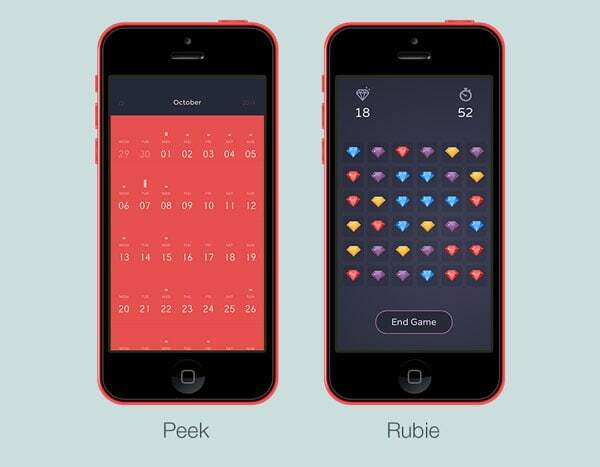 Take a look at apps like Rubie, Sky, Rise or Peek. Their designs are filled with gorgeous hues, as color is a prominent part of the design. Rubie and Peek demonstrate that darker designs don’t only have to use black and dark grays. Don’t limit yourself and instead try using darker purples or reds in order to create an elegant yet friendly dark design. 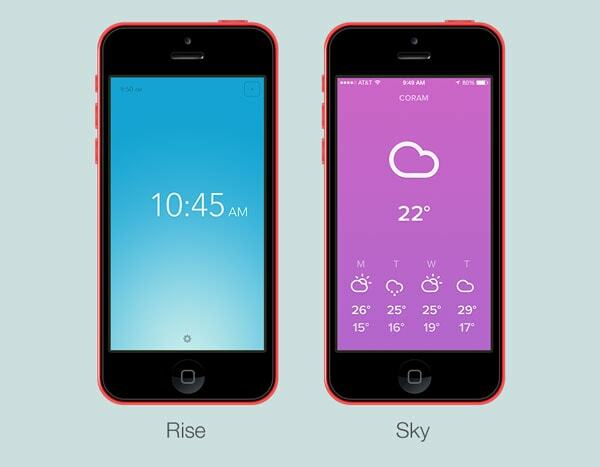 At the same time, there are apps like Sky and Rise that embrace gradients made up of vivid hues. It’s enlightening to see such strong colors so prominent within an app’s design. Both of the apps look so spectacular. Don’t you think? It’s all thanks to embracing color as a significant design element. Many apps have embraced simplicity and clarity within their design; it’s really delightful to think about this. Designers have been aiming toward simpler and cleaner designs for years, especially with minimalism, however recent trends show that this is still the case. In 2012, Google did some research that proved simple websites are better. If you want to read their write up, here you go. All in all, the idea is very straightforward. Simpler websites are easier to digest. Websites that are more complex require more cognitive effort from the visitors providing an inferior experience. Therefore, the simpler the website visually, the better. The same is true of mobile apps. Conversion XL wrote an article about why simple websites are scientifically better based on the Google research. 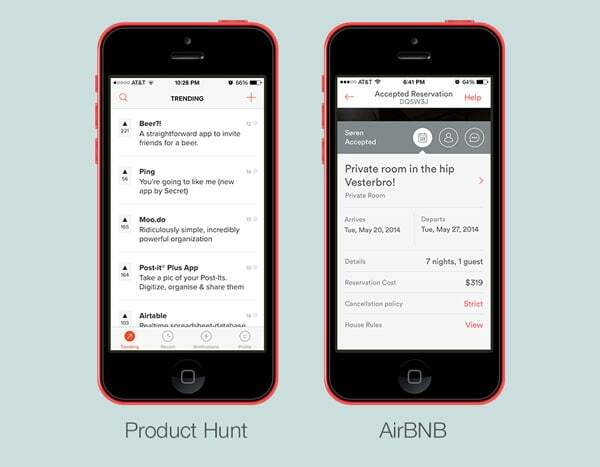 Take an app like Product Hunt or AirBNB. Both provide simple and clean interfaces that display content carefully and well. Product Hunt shows off a lot of various content in a list form but scrolling and scanning through it is so easy to do. Digesting the content is not hard at all. The same is true for the AirBNB app although it has a lot more information to offer. On any given page, albeit it a listing or messages, information presented to you is never overwhelming. It’s interesting to see that some apps out there are trying to promote a sophisticated and elegant vibe through design. It’s not something common on websites either, but it’s significantly less common among mobile apps. This type of concept goes well with related business like hotels, bars or restaurants that want to create an intimate feeling within their apps like they would within their establishments. There is nothing better or worse about this type of design; it’s nice to see apps trying out a non-typical design style though. 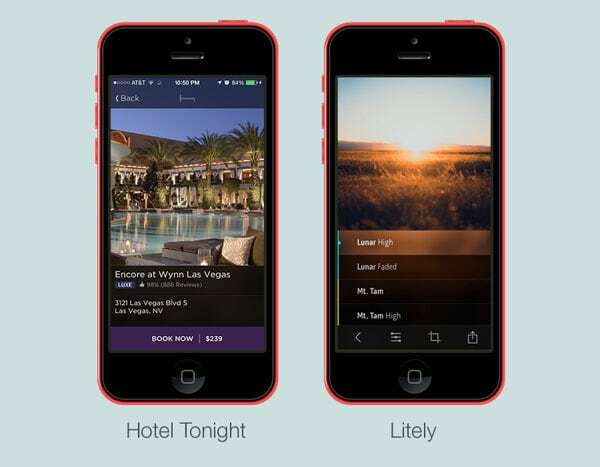 Two examples of such design are Hotel Tonight and Litely. Both apps have a dark design scheme characterized with elegance, sophistication and a sense of intimacy. It’s a different design style altogether but it goes along in creating this atypical looking app. Hotel Tonight promotes last minute hotel deals but it does so in high style. No one said booking hotels has to be done in a boring white and light color scheme. On the other hand we have Litely, which allows you to edit photos on the go with a dark yet fashionable interfaces. When you really think about it, how many of the apps you use can be considered unique or innovative? Overall, none of the apps we use often provide us with something out of the box. Maybe the service or product was once new and innovative but after using it for a while we get used to it and it’s anything but new, it’s normal. There are some brilliant and clever apps out there that should get the praise for thinking out of the box in terms of executing a unique app. We don’t always notice how smartphones get in our way. Kimd is an incredibly simple app but such a smart idea. The creator, Julie Chabin, was fed up with bright screens interrupting events like concerts for fellow viewers so she created a dimmed photo and video taking app. Such a simple and even stupid ideas but it works! With the modern world using smartphones nonstop it’s easy to forget how strange it is when people use their smartphones in certain situations. 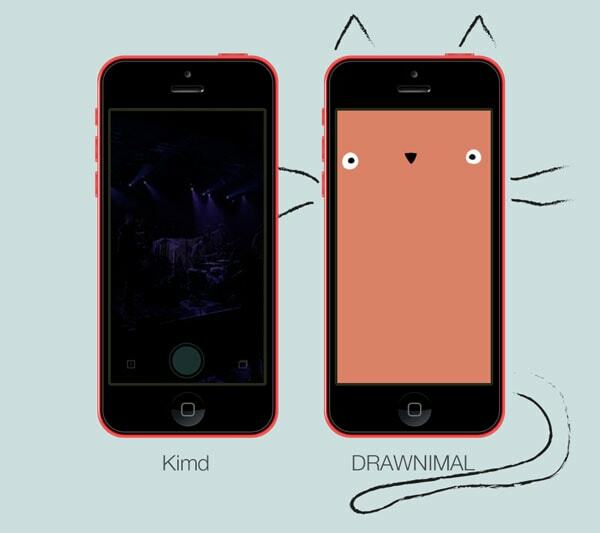 Another wonderful example is DRAWNIMAL. It’s an app for kids that gets them drawing and learning the alphabet. Again, this is not a first app of its kind in terms of goals but in terms of execution it’s pretty innovative. The app expands the learning experience past the smartphone by allowing kids to draw animals on real paper with real pencils and using the smartphone as part of the drawing experience. It adds an additional dimension to the app and it doesn’t constrain learning to just the digital device. The execution of this app is different and it’s what makes it innovative. The one thing I’m sure you’ve noticed is the widespread usage of photos within all kinds of apps. They are used as content and as design elements. Digital photo are becoming such an incredible part of our lives; it’s a fascinating trend actually because it’s so personable as often times the photos you get to use or see are yours. Using photos within apps can be a powerful tool. VSCO and Steller are two amazing photo based apps. They both try to use your photography skills and let you share them. VSCO, for instance, has photo editing functionality as well as photo showing/sharing. This means you can edit pictures as you please and upload them to your own profile page. It’s a tight community, which strives to share photos of high quality. 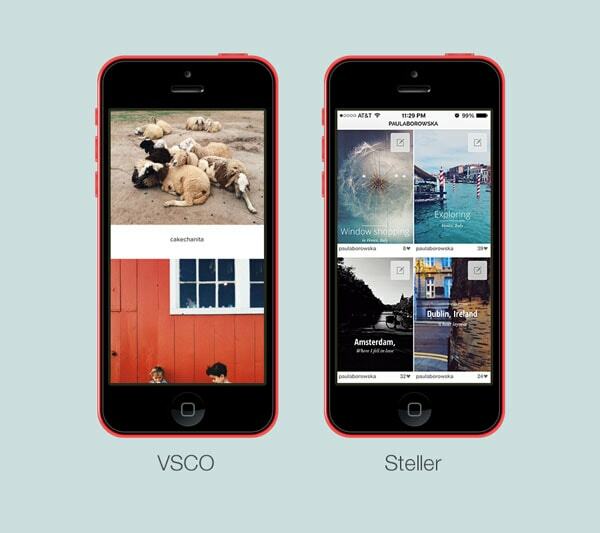 Steller allows users to create photo stories. They can be as short and as long as you wish, filled with text, videos and of course, photos. This small community has so many different photo stories you can browse through, like DIYs or travel logs. So there you have it, five lessons from currently available mobile apps. What do you think are the upcoming design trends among apps? Do you think designs will keep it safe or become even more innovative in terms of design and app ideas? Would have loved to have seen some new Material Design apps for Android in this post. You’re right. Definitely in the next one! Whilst Material Design *is* lovely, I think this article is deliberately addressing platform-agnostic patterns – material is strictly Google. Good reminders. For me, I really appreciate the impact that the simplicity of mobile design has had on the desktop world. The simpler and more user-friendly things get, the better. I hope one day we aren’t bombarding people with advertisements and shiny things.